Galganov's Easy Recipe for the Amazing Baked Bean Pizza! Prepare your toppings and set aside. We recommend baking on (non-oiled) parchement paper or on a perforated pan or screen on a stone as beans can soften the crust and these methods will help to absorb some of the humidity that beans, as a topping, add to the crust. With the rack (and stone if applicable) on the lowest position in the oven, preheat your oven to 425o F (220o C). Remove the dough from the bowl to a lightly floured work surface. Flatten out the ball of dough to work out the air bubbles and cover it with a towel. Let the dough rest for 5 minutes. form the dough to fit your pan. spread your selected cheeses over the surface. Bake your pie on the lowest shelf in your oven (not the oven floor), at 425o F (220o C) until the crust is cooked and the cheese starts to turn golden. Baked beans can be saucy. Make your dough just a little thicker than usual to help prevent liquid penetration of the dough ... and subsequent softening and tearing of the crust. While provolone is a very common cheese to mix with for pizza, we prefer the caciocavallo. We also like a bit of romano when it's available. Try your own blends to discover what you like best! The Pizza adventure will never end. Back in the mid 1980's we sat at the dining table considering what to eat. We had a pot of home made baked beans, some fresh pitas and an assortment of wonderful cheese including a bit of mozzarella and romano. At that time we were still using pitas for pizza crusts. We had not, yet, started making our own but it was a great way to get an instant pizza and we certainly weren't missing store-bought pizza. So it occured to us that to have baked beans with bread (or with pita) was very normal ... and to have it with cheese was very normal. What could possible be wrong with a bean topping? On that summer day in the mid 1980's, the baked bean pizza was born to us. We had a new food. Now we make our own pizza crusts. Nothing wrong with putting baked beans on a pita for an instant baked bean pizza but a real, home made pizza crust is an incredible treat! 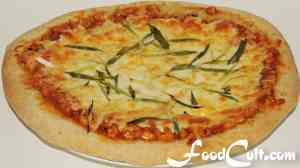 Baked bean pizza is quick and easy to assemble from your already made baked beans. Choose your favourite crust from our 50 % whole wheat, or create a lighter (30 %) crust ... or watch the main "pizza" page for new crust variations! For an our easy, basic, white pizza dough, please visit http://www.yvonneandmason.galganov.net/recipes/pizza.html - perfect for beginners and seasoned, pizza cooks!